Ed Ruscha in his studio. Editor's Note: The following is the foreward to Sign Painters a new book from Princeton Architectural Press by Faythe Levine and Sam Macon and printed with premission of the publisher. Growing up in the Southwest in the 1950s, I was exposed every day to hand-lettered signs, usually on wrinkly sheets of metal, say, for an unplanned watermelon sign or a hamburger menu. Some sign painters had the facility to make any word grouping look good and make any letter of the alphabet look stylish. The watermelon sign, a particular American icon, often misspelled and full of genuinely folkish paint strokes, was everywhere. Then there were the painters who added impressive illustrations along with the smoothly handled letterforms. Sometimes they did it with gloss black one-stroked enamel letters on a glossy white background. Wow! And the ecstasy of seeing a sign on metal with a beautifully built-up edge of paint bulging from one side of the letter stroke! It’s not science, but it’s beautiful and all artists recognize this. These painters knew about optical illusions, that some letters like O and S need to go a shade higher and lower than the baselines to appear equal in the lineup. This is something you take to heart. I’m reminded of the late Clark Byers (ca. 1915–2004), known as the “barnyard Rembrandt.” He painted SEE ROCK CITY (a roadside attraction outside of Chattanooga) on the sides of more than nine hundred barns in Tennessee and Georgia. He said, “I never passed up a good roof.” That leads me to flash forward to today’s world with our seven-story wrap- around motion graphics à la Las Vegas or Times Square. We have seen sign painting grow from primitive instincts and humble beginnings to this present world of advanced culture. Obviously I am all for the triumph and nobility of the main thing: PLAN AHEAD. I'll echo KRE and say great article. Really looking forward to the slideshow but it seems to be empty. Will there be a slideshow to accompany the article? 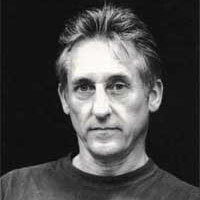 Edward Ruscha is an artist in California who has been the subject of numerous museum retrospectives, and in 2005, Ruscha was the United States representative at the 51st Venice Biennale. His early career as a graphic artist continues to strongly influence his aesthetic and thematic approach.